Are we making your forecourt look untidy? We’re jumping a bit out of sequence in posting this now – the blog itself’s still about two weeks back – but we thought you might like to know about this. The van is currently hors-de-combat. We’ve already mentioned the CV joint knocking on the way through Spain and France. A new one was ordered, arrived, and was fitted after the world meeting. The clonking stopped. Briefly. It sounded like a different joint, then got worse and we were in no doubt it was the newly replaced joint that was duff. Still, the original clonked for 1,500km or more, so we can consider our options at slight leisure. Yesterday, as we left Argentat along the Dordogne river, the clonking turned into a loud bang – and forward motion stopped. We called ADAC’s recovery line (cheaper than UK-only AA/RAC, but covering whole of Europe), and started in on lunch. Not long after, a chap in a Berlingo stopped, to tell us he was going to tow us… <insert comedy mental image here> and was just off to collect the truck. So – by half past four, we were in the yard of the VW dealer in Brive-la-Gaillarde, Axess Automobiles. Clothing etc was rummaged together, a taxi was called, and we headed for the tourist office to find a hotel – ADAC pay for three nights accomodation whilst your vehicle’s fixed. And, to the best of our knowledge, nothing has happened since. We’re about to start night two, and – apart from a quick phone call at lunchtime to say that it “hadn’t been diagnosed yet” (The driveshaft rotates when you let the clutch out, the wheel doesn’t. Diagnosis should be quick enough, even for a main dealer.) – we’ve not heard a sausage. Plan B (and, yes, it may very well involve tactical deployment of an international incident) is being hatched. Still, on the bright side, the hotel’s very pleasant, has decent internet access (for the first time in a while…) and we’ve used them as an address to order a replacement camera battery charger and memory card reader from Amazon.fr, so we should have pictures on the last couple of posts – and be caught up with new posts – by morning. So – what’s Brive like? The guidebook wasn’t exactly inspiring about it, so our expectations weren’t much higher than our spirits as we cruised straight past some fantastic sights and villages on the back of the truck. The anonymous industrial estate the dealer’s on didn’t help much, either. But last night and today, we’ve not done much but wander around. It’s not a destination, let’s be honest – especially given the location in the heart of the Correze, just off the Dordogne river, surrounded by utter loveliness. But it’s a very pleasant town. We’ve spent the afternoon at a museum looking at the local WW2 resistance – and learnt a lot about bits of the war that were totally new to us, such as the campaigns to get French workers to migrate to Germany to fill in their labour shortage – and then tripped across a scintillating art exhibition in a small church. Last night being Monday, open restaurants were in short supply – and whilst the one we ended up eating in didn’t leave us disappointed in the food, it was the floor-show as Madame got ever more irate with the young waitresses which we’ll remember longer. But none of that affects the overall tone of our stay. We’re here – let’s be honest – against our will, without transport, and without any of the things we’ve grown used to. Helpless. On Sunday night, we cooked some pasta sauce, enough for Monday’s meal. That’s sat in the (switched off) fridge, and will have to be chucked. Pity, it was delicious. Meanwhile, we couldn’t buy any of the wonderful produce from the market in town this morning. We feel like we’re missing something major. And it’s all a bit depressing. 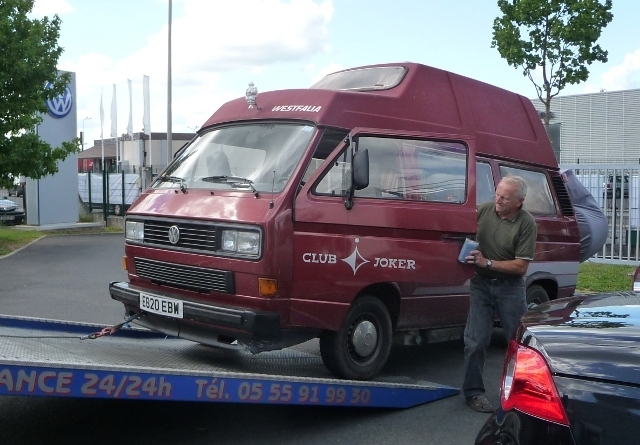 This entry was posted in By Country - France, Personal stuff, Van stuff. Bookmark the permalink. 11 Responses to Are we making your forecourt look untidy? A caravan? How dare you? I was actually thinking of a Saab 900 with Toppola camper top. Not sure why I mentioned the Saabo caravan. Am really enjoying your adventures and trust that your holdup in Brive means you can play blog-catch-up. Bon Chance! and give my regards to Slim if you see him. Loving your blog and learning a lot, too. 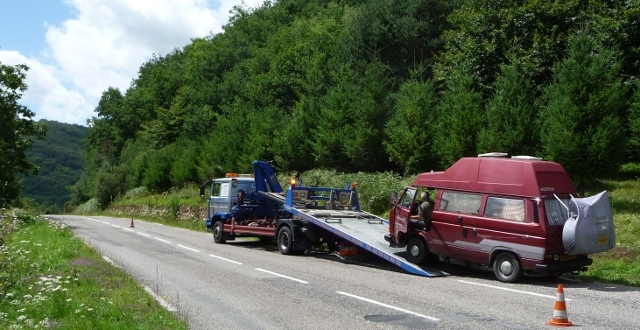 Sorry about your camper being broken – hope you’ll soon be back on the road.